Peter Townsend was Professor of Sociology at the University of Essex from October 1963 to December 1981, and chairman of the Department during its first seven years. He was elected Pro-Vice Chancellor (Social Policy) and served from 1974 for three years. He moved to the University of Bristol as Professor of Social Policy in January 1982 and became Professor of International Social Policy at LSE in 1998. He died in 2009. 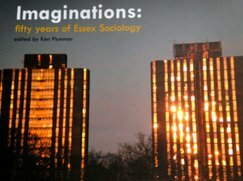 The development of sociology at the University of Essex is in many ways the recent history of the subject in Europe. After the sweeping claims for the subject in the 19th Century there was little consolidation institutionally by the time of the foundation of the new universities in the mid -1960s. Essex was in the vanguard of a new professional, scientific and international approach to the subject and the early years of the establishment of the department in the University illustrate both the internal debate about the scope of the subject and its intellectual priorities and the external interpretation of its role and functions -which was sometimes hostile and often uncomprehending or dismissive. This entry was posted on August 13, 2012, 6:26 am and is filed under Former staff, Obituaries. You can follow any responses to this entry through RSS 2.0. You can leave a response, or trackback from your own site. The department has an interesting tale to tell - be part of it! You can read about the department's history through the search options; and can let us know of matters you would like to see added -including your own story, info and photos if you wish. Note: this is a personal site and is not directly linked to the University of Essex.